Helen's Hideaway | 5 minutes from anywhere in Port A! 5 minutes from anywhere in Port A! Wanna get away to the beach? 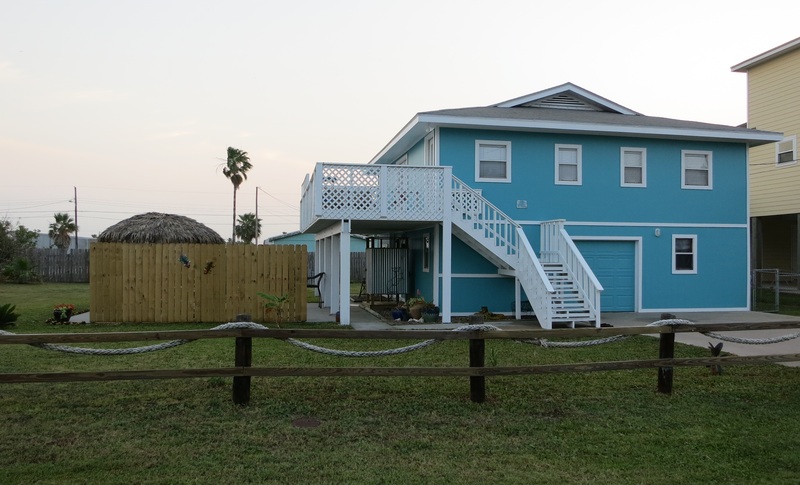 This Port A property sleeps 10 in 3 bedrooms and 2 1/2 baths! Private in-ground POOL with a deck and LOTS of great outdoor spaces- large yard, patio with palapa and upstairs deck. PLEASE NOTE: WE DON’T BOOK THIS PROPERTY FROM THIS WEBSITE. YOU MUST FOLLOW THE LINK BELOW OR CALL THE NUMBER PROVIDED FOR INFORMATION ON RATES AND AVAILABILITY. Are you dreaming of a beach vacation? Do you long to walk barefoot in the sand and let your worries melt away? If so, then Helen’s Hideaway is the perfect place to make your Port Aransas dreams come true. Located in a quiet corner of “Old Town”, this property is just 5 minutes from anywhere you want to be in Port A, especially that famous beach. This dog-friendly house sleeps 8 comfortably upstairs, 6 downstairs, and features fabulous outdoor spaces. The in-ground pool will be finished in mid-March. The upper deck is great for watching the gorgeous sunsets, and the ground level patio is perfect for a BBQ cookout after a great day at the beach. Kick back, take a swim, enjoy the patio, or cool off in the custom made outdoor shower. So come on down and enjoy all that Helen’s Hideaway and Port Aransas has to offer. I’m very interested in staying here. Can I have a price guide? Do you have any additional pictures of the place? Aaron, thanks for your interest. if you look on the right hand sidebar on any page of the website, you will see a phone number for booking information. You can call that number for pricing and availability. The Be Nice Express & The Be Nice Club would love to check this out….looks beautiful.!!! Victoria, glad to hear you would like to reserve this property. Call 361-332-2858 and talk to Leslie. Thanks! Hi do you have June 17-19 available ? And could you send me pricing ? Thank you !!!! I got this info from your daughter in law which I posted on moms of New Braunfels .